TV show dates: June 21, 2017 — present. Performers include: Steve Harvey (host). 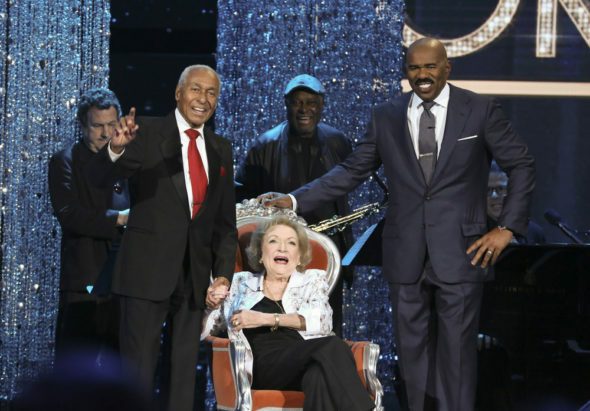 A spin-off of the Little Big Shots TV show, which features the world’s most talented kids, Little Big Shots: Forever Young is a comedy variety series from Ellen DeGeneres and Steve Harvey. As host, Harvey showcases young-at-heart seniors with hidden talents, sparkling personalities, and the wisdom only born of experience. Harvey interviews musicians, singers, dancers, and other talented senior citizens between ages 60 and 103 years old, who also perform on the series. Some are athletic, some are particularly notable in their fields, some are dancers, singers, musicians, magicians, or social media sensations. All of them, though, are forever young. What do you think? Do you like the Little Big Shots: Forever Young TV show? Do you think it should be cancelled or renewed for another season? I love it and would like to submit my Step-Dad Grady Gaines to be featured on a episode. He’s a 83 saxophone player that performed with and has been mentioned on The Little Richard Story. You can learn more about him at gradygaines.com. He has been honored in Houston, Texas where he now resides. If you check him out, I’m CONFIDENT that you will feature him. We love you Steve! Enjoyed Little Big Shots & look forward to Forever Young.